If you don't remember John Lucas III, you'll probably most remember him from this. But Raptors fans might also have remembered him from the time he dropped 13 points in the fourth quarter to beat the Raps 94-82 back in March. 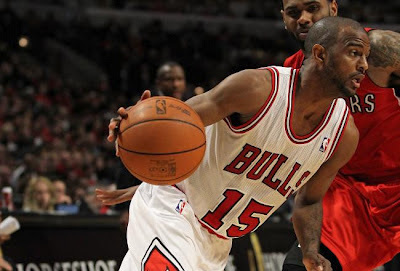 The Toronto Raptors signed the former Chicago Bulls point guard to a two year deal back in July to fill in at the third point guard. Lucas took the point guard reigns for the Bulls mid last season when Derrick Rose went down due to injury. He's a well-traveled basketball journeyman, having played all over the globe from China to Italy, to the D-League and now to the NBA. He's a 5-11 guard who has a confident attitude on the floor and can score the ball when needed. Expect Lucas to be the third string point guard that will pick up minutes behind Kyle Lowry and Jose Calderon. If he gets 10-12 minutes a game, he could be a game changer, sparking the offence when things aren't clicking with the starting unit. And if a situation presents itself, through injury or through trade....ahem, Jose....we'll be seeing more of John Lucas.